Clinch, who was born in Lakewood, N.J., graduated from Lakewood High School in 1972 and from Syracuse University in 1976. She married Jon Clinch in 1976 and they moved to suburban Philadelphia where they worked in advertising and also had their own ad agency for 20 years. 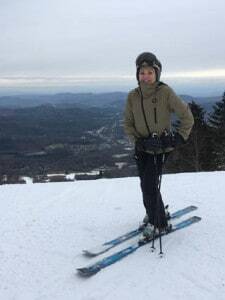 However, at age 13, her family went on vacation “to a small resort in New York State where they had a rope tow, and I was totally hooked,” she recalled. MT: So you’ve been skiing ever since your teenage ski trips north? MT: When did you return to the sport? WC: One day, when I was 40, Jon suggested we take a ski trip, and it was like handing a crack pipe to an addict. I started skiing again with a vengeance, and I haven’t looked back since. MT: How’d you end up in Vermont? WC: Once we got into skiing, we started coming up to Killington and Okemo pretty regularly. At first we had a season rental, but we ended up buying a place in Plymouth in 2004. Then, in 2007, we moved here full time. MT: How were you able to do that? WC: Jon had been writing on the side, and he sold his first novel, “Finn,” to Random House. It ended up being named one of the year’s best novels by The Washington Post, The Christian Science Monitor, and The Chicago Tribune. We closed our ad agency, sold our house in PA, and moved. Jon followed “Finn” with Kings of The Earth, and The Thief of Auschwitz. MT: He’s also plays guitar right? WC: Yes, sometimes he plays solo and sometimes with members from Gypsy Reel, a local Celtic band. He plays in local restaurants like Bentley’s, the Woodstock Inn, Stemwinders, and the Public House. MT: So living here, you can ski more now? WC: I think I’m making up for lost time. I’ve been able to ski most every weekday. I have my season pass at Okemo, but I get around to as many of the Vermont resorts as possible. Each one has something special to offer, and I love them all. MT: How did TheSkiDiva.com come about? WC: I didn’t have any female friends who skied so in 2006 I started TheSkiDiva.com, an online community for women who love to ski. And now I have tons of ski friends all over the world. MT: You won a Harold Hirsch award for best ski blog on TheSkiDiva.com last year — can you tell us more about your blog and SkiDiva? WC: TheSkiDiva has two parts: an online community and a blog. The blog, which won the award, is where I post interviews, reviews — really, all sorts of things related to skiing and the outdoors. TheSkiDiva community is a bit different. It’s more of a place where women skiers can come together to converse about anything and everything ski-related in a testosterone-free environment. There’s everyone from beginners to the highest levels of experts; from women who know very little about equipment and technique to those with vast stores of expertise. There are loads of firsthand gear reviews and discussions about various ski destinations. And there’s a lot of great advice, like what to do when you think your skiing has plateaued or how to handle fear or even why more women aren’t skiing. With about 5,200 registered members, TheSkiDiva has become the leading online community for women skiers. It’s a wonderful, supportive, and respectful place. MT: You’ve also become an author with skiing figuring into your books, right? WC: I’ve written two ski mysteries – “Double Black” and “Fade To White.” Both focus on a young woman who leaves her cheating fiancé to become a ski bum in a small Vermont town. I’ve always found the culture and environment of ski towns particularly fascinating. There’s a real contrast between the locals, who are trying to go about their ordinary lives, and the out-of-staters who come to the area for short periods of time and then go back home. Each depends on the other, yet both have entirely different perspectives. It’s a huge culture clash. I thought it would be interesting to write about how both of these groups work together to solve a murder. MT: What do you love about Vermont? WC: Absolutely everything. I love the mountains, the outdoor lifestyle, the scenery, and the lack of big box stores, shopping malls, and traffic. People have suggested that I might prefer living out West because the skiing’s bigger. I’ve been out West, and it’s not for me. I’m an East Coast person, and no place else comes close to what I find here in Vermont. I feel very lucky to live here. WC: I know this may sound trite, but it’s true: Do what you love, and happiness will follow. That’s what I’ve done, and it’s made a world of difference.